The UW Hyperloop Team placed Fourth overall in the 2018 SpaceX Hyperloop Pod Competition. 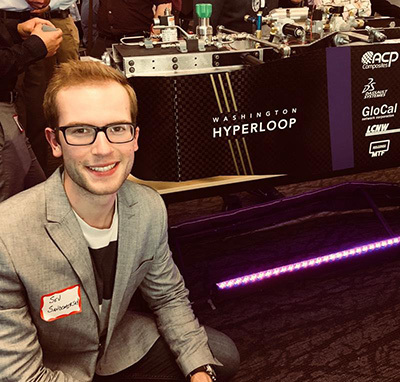 UW Aeronautics and Astronautics students helped propel the UW Hyperloop Team to an Innovation Prize at SpaceX’s Hyperloop Pod Competition at SpaceX headquarters in Hawthorne, California, this summer. This competition is the open-source SpaceX-sponsored vision of CEO Elon Musk to create a new high-speed system of pods traveling in nearly airless tubes underground. This travel system would ultimately be cost and energy-efficient and revolutionize both commuting and intercity travel. Competitors pass an exhaustive series of performance and safety tests before earning the privilege to run their pods in the 1.2-kilometer-long tunnel to vie for the fastest performance. Sev Sandomirsky (BSAA 2018) shows off the UW Hyperloop pod at the unveiling ceremony at the SpaceX Hyperloop Pod Competition in Hawthorne, California. 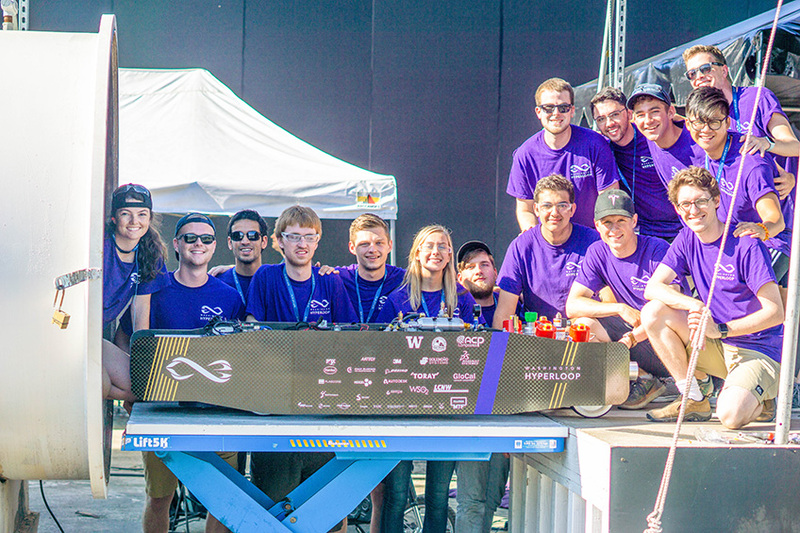 While WARR won the top prize for the third year in a row, UW’s Hyperloop pod beat out all other U.S. competition and earned a nod from Musk. The Hyperloop Pod Competition is broken up into two main components: testing week and final competition day. Testing week runs Monday through Saturday during which engineers from SpaceX and Musk’s Boring Company certify the pods for safety after many checkpoints. Sandomirsky was impressed with the intensity of the experience and notes that the teams were held to the same high standards as teams from SpaceX or the Boring Company. The testing week included two all-nighters for the entire team. “When a problem arose, I made 38 phone calls over two days to resolve it. In Hyperloop, you don’t make excuses. You get it done,” he says. 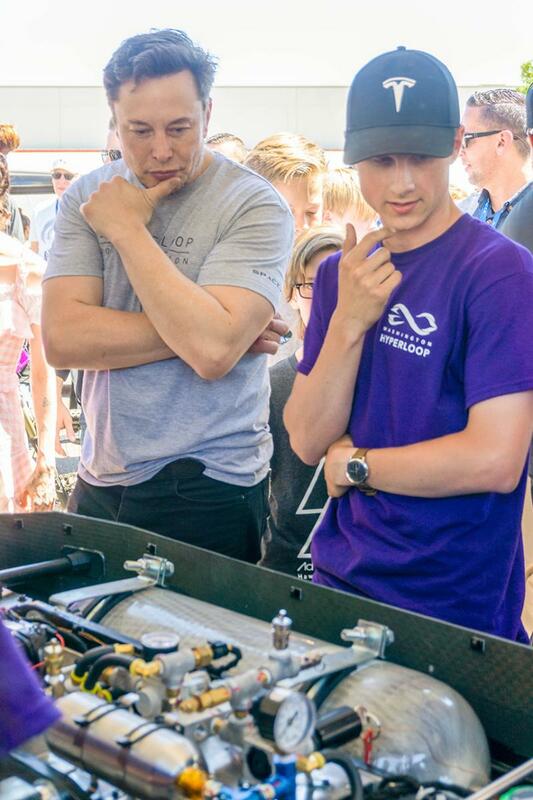 UW Hyperloop Co-Director Mitchell Frimodt explains some of the main features of the pod to SpaceX CEO Elon Musk. As the UW Hyperloop team refines its design for the next competition, they already know they want more A&A students to help them master the cold gas thrusters. “The design and manufacturing of a safe and high-performing cold gas thruster is no easy feat. The technical knowledge, experience and contribution of A&A students become increasingly important to the success of the team and the performance of the pod as we move forward with our design and push the limits of horizontal rocketry,” says Frimodt. UW set the bar high, and SpaceX will be taking a close look at the award-winning team’s next efforts.